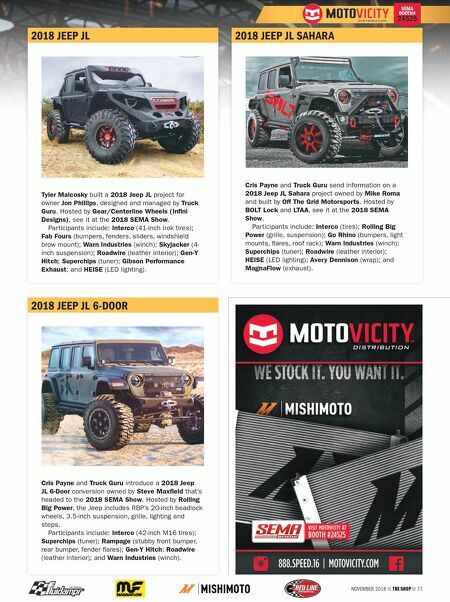 NOVEMBER 2018 THE SHOP 77 SEMA BOOTH# 24525 2018 JEEP JL Tyler Malcosky built a 2018 Jeep JL project for owner Jon Phillips, designed and managed by Truck Guru. Hosted by Gear/Centerline Wheels (Infini Designs), see it at the 2018 SEMA Show. 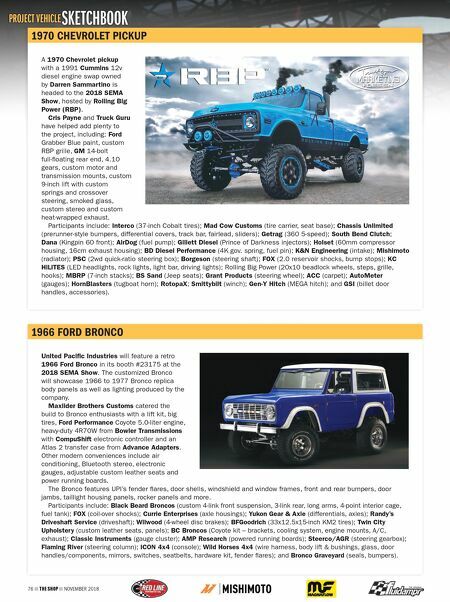 Participants include: Interco (41-inch Irok tires); Fab Fours (bumpers, fenders, sliders, windshield brow mount); Warn Industries (winch); Skyjacker (4- inch suspension); Roadwire (leather interior); Gen-Y Hitch; Superchips (tuner); Gibson Performance Exhaust; and HEISE (LED lighting). 2018 JEEP JL SAHARA Cris Payne and Truck Guru send information on a 2018 Jeep JL Sahara project owned by Mike Roma and built by Off The Grid Motorsports. Hosted by BOLT Lock and LTAA, see it at the 2018 SEMA Show. Participants include: Interco (tires); Rolling Big Power (grille, suspension); Go Rhino (bumpers, light mounts, flares, roof rack); Warn Industries (winch); Superchips (tuner); Roadwire (leather interior); HEISE (LED lighting); Avery Dennison (wrap); and MagnaFlow (exhaust). 2018 JEEP JL 6-DOOR Cris Payne and Truck Guru introduce a 2018 Jeep JL 6-Door conversion owned by Steve Maxfield that's headed to the 2018 SEMA Show. Hosted by Rolling Big Power, the Jeep includes RBP's 20-inch beadlock wheels, 3.5-inch suspension, grille, lighting and steps. Participants include: Interco (42-inch M16 tires); Superchips (tuner); Rampage (stubby front bumper, rear bumper, fender flares); Gen-Y Hitch; Roadwire (leather interior); and Warn Industries (winch).